When it’s time to set up your next D&D game map, Dungeon Tiles can make quick work of it. The full-color, thick cardboard tiles from Dungeons & Dragons make it easy to whip up a floor plan, drop some dungeon dressing (statues, doors, braziers, etc.) and get to rolling dice. 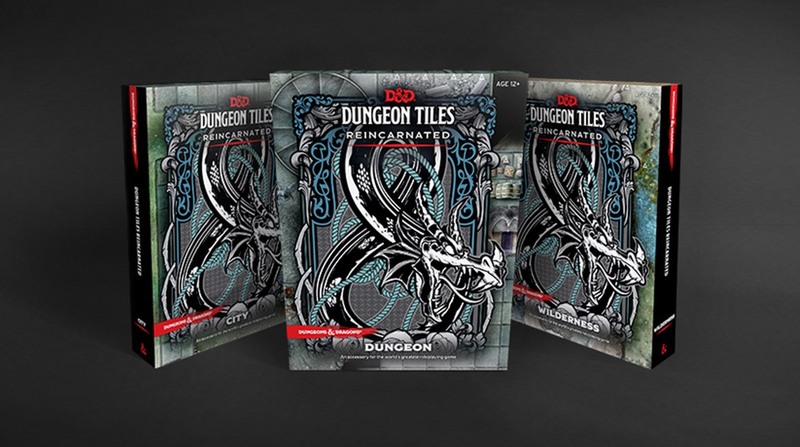 Dungeon Tiles Reincarnated sets have 16 sheets of tiles compared to 10 in the old “master sets,” so you’ll have even more pieces to play with. And the best part: The new pieces are actually new. They’re new shapes, new designs, new concepts that will greatly expand your dungeon-building abilities. Back in the days of D&D’s 4th edition Essentials, a group of “master sets” were released along with several smaller specific expansions cover the Underdark, battlefields, castles and more. D&D is now offering three new sets of Dungeon Tiles Reincarnated: the Dungeon, the City and the Wilderness. I picked up the brand-new Dungeon set, and I have to say: I’m pretty impressed. Time for a confession: I have most every set of 4e Dungeon Tiles. I’m a big fan of maps and minis, and though I do occasionally create my own maps for games, whipping up a quick dungeon or roadside map using the pre-made tiles is often a lot easier and much quicker than slaving away for hours in Photoshop. For comparison’s sake, I busted out my old Dungeon “master set” and went through it at the same time I unboxed the new Reincarnated set. How do the two sets stack up? Well, very similarly. A large portion of the tiles are the same (even the storage boxes, which can be used with the tiles, are identical), but there are lots of new tiles, too. Put it this way: The Reincarnated set is like Dungeon Tiles Plus. The new pieces are new to Dungeon Tiles, and what I like about them most is that they offer new designs and (most especially) new shapes to play with. All of the old tiles were squares or rectangles, but the Reincarnated tiles have pieces that will give your rooms diagonally cut corners, scalloped edges and smooth, round shapes. All of that gives you more options than your standard rectangular castle. There are meandering paths, diagonal passageways, rounded staircases, triangular pits and rooms lined with arrow slits. There’s also plenty of new dungeon dressing to play with including staircases and pillars, a few arcane circles, magic portals surrounded by lightning, stalagmites, strange eggs, barrels, pits, subterranean rivers and magic runes. My favorite is a giant basilisk-like statue that’s surrounded by pools of blood. And even though it’s a Dungeon set, there’s more than just stone floor textures. There’s rubble and sand, subterranean paths lined with mushrooms, pits that open into lava and water and magic runes inlaid into the floor. You can tell a lot of thought went into expanding this set because many of pieces expand the use of tiles in the set or tiles you may already have. New hallways let you connect rooms in different ways, transitional pieces between stone floors and sandy caves let you expand your dungeons and tiles featuring magical iconography have different colors on the flipside so you can show when a glyph of warding has activated. And if you’re a collector of Dungeon Tiles, rest assured that the new Dungeon Tiles will work very well with your old Dungeon Tiles. The material, color and design is the same. Even if quite a few tiles in the Reincarnated sets are doubles of your old ones, it just means you’ll be able to create even bigger dungeons. And who ever complains about that? If you purchase them from Amazon, a small portion of the proceeds goes to help Crit For Brains.